DERMagic receives Outstanding Employer Award! We are beyond thrilled to make this happy announcement… Are you ready? 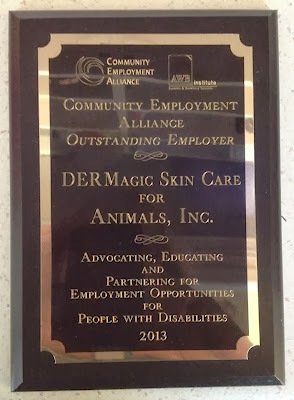 DERMagic Skin Care for Animals has just received the coveted Outstanding Washington Employer award from the Community Employment Alliance (CEA) and Association of Washington Business (AWB)! Yes, it’s a lot to take in, but we couldn’t be more proud. When we first started this business, one of our goals was to reach a point when we could give back to our community. We are so proud to say that we have reached that goal. This award celebrates our support of the Northwest Center, a leader in promoting the rights and independence of infants, children, teens and adults with developmental disabilities. DERMagic now employs five part-time employees from the Northwest Center, who make product samples and label some of our products. Larissa prepares samples of DERMagic shampoo bars! The Community Employment Alliance and Association of Washington Business Outstanding Employer Award honors Washington State businesses, government agencies and non-profit corporations that have made exceptional efforts to employ people with disabilities; and who by their recruitment, hiring, retention, and promotion policies are role models in their community. Employers are commended for their efforts on behalf of people with disabilities throughout Washington State during an awards luncheon at the Kitsap Conference Center in Bremerton, WA. We are very proud of this award and will continue to strive towards community initiatives that improve the lives of pets and their people. A special thanks to the Northwest Center for creating such a stellar network of people, and to the Association of Washington Business for continuing to support this important cause. Together we are stronger!